Cherries teach us the meaning of “Carpe Diem”. They are here today and gone tomorrow. Get them while you can! I realize that it has been three weeks since I last posted anything. In fact, it’s been three weeks since I have been able to write anything more complicated than my signature at the bottom of a check and even that has seemed daunting most of the time. Instead, I have been handed the task of gathering up all the little seeds suddenly blown off a dandelion and put them back on their stem in the same place and order they were before the wind carried them away. My efforts have not gone unrewarded. There are small, but brief moments of satisfaction when I find one softly resting on a pillow. At other times, I find that one has fallen into my hand after gently petting it off the head of my Labrador. Sometimes it has been a call from my sister who has found one three states away. Mostly, it has been Andrew who has helped me find these little seeds. Shining his flashlight (which he always keeps next to his bed) in places obvious and obscure, he reaches for the impossible and gently places it in my hand or playfully leaves it in his hair for me to find when he bends down and lets me give him a good night kiss on his forehead. Grief is a funny thing. We go through life trying our hardest to avoid it (at least the things that cause it), yet we can never be fully human without opening up ourselves to its possibility and to the pain it causes. Avoiding it is senseless and impossible, but yet we try. Much like my daily attempts to look in the mirror to see a reflection that can’t truly exist at 48, I walk through life thinking that it will always be just how I imagine it should be. It is possible, for one brief moment, at the right angle, and in lowered light to catch a reflection that is amazingly solid and very close to the self-image I have carried for 25 years. It is also possible to walk or crawl through life with the illusion that we are immortals and that only the unlikely destruction of Valhalla could ever change that. Then someone throws a rock and the mirror shatters. A recent photo is brought out and I am confronted with someone I barely recognize, but clearly shows that I am nearing half a century. A dog dies and fourteen years suddenly fall through your fingers. A parent gets sick and the possibility of life, as you know it, can be changed forever. At these moments we try desperately to be strong and firm like a cactus, but we are dandelions: One moment enjoying the gentle breeze of summer when a child picks you up, makes a wish, and sends you off to be changed forever. Three weeks ago today, my parents were driving back to Utah from Washington when my mother started feeling ill. Her back was hurting her and she started getting feverish. Not able to continue they went to the ER in Pendleton, Oregon, where after attempts to help her keep food down failed, she was admitted for the evening. At 5:00 am the next morning, my father was called. Mom had taken a turn for the worse and they didn’t have the facilities to help her. Unfortunately, they had waited five hours to call him. She was now very ill and every second counted. My father had to decide the next steps and she was placed on a life flight and flown to Boise. He watched her leave with a frantic team trying to stabilize her. The hospital staff gave my father her clothes and her wedding ring and suddenly the real possibility of losing her hit him and the dandelion seeds started to blow. He got into the car for what would be the longest six hours of his life. He dreaded ever moment, fearing the worse. And for good reason: the life flight team said that if the light had been even a couple minutes longer she would not have made it. I didn’t see the missed calls from virtually every member of my family until 8:30 am. They had started around 5:30 am and I knew something was wrong. Finally getting hold of my sister, a nurse with a usually optimistic outlook of matters of health, I found her crying and suddenly felt the winds that would start to tear apart my own tenuous hope that tragedy happens somewhere else. Much like living in a land of earthquakes where I think about the possibility of devastation almost daily, I am still taken by surprise when the earth starts to move beneath my feet. We live in a world with a final destination assured, but are never given an ETA. When it does come, it is never welcome. My sister let me know that there was a good possibility that we wouldn’t make it in time to say goodbye. I was able to get an 11 am flight and had to move quickly. Andrew was at school and would come home to find his father gone and learn that his beloved grandmother was very sick. The normally short flight took over five hours and when I finally saw my mother, intubated and on full life support, she was mostly unrecognizable. She had gone into Sepsis shock and the doctors were not very hopeful. My sister quietly cried, my father couldn’t bear to look at her, and I strained to hold it together for both of them as we waited for my brother to arrive. Later, when I finally got hold of Andrew, I tried my best to shield him from the pain. It was useless, just hearing his voice reminded me of the special relationship that my mom had forged with him. The possibility that he would have to face another loss, this soon brought down my own defenses and I sat silently crying as I started to imagine a world without my mom in it. Not completely without hope, we knew the one thing that could get my mother to move mountains was her family and we would all be there no matter what. For three days and nights we stood vigil. We did out best to let her know we were there and hoped that some of our “I love you, mom’s” were able to penetrate the dense netherworld of a strong Propofol drip. Somehow, on many occasions she was able to tap her finger against our hands in response: “tap, tap, tap, tap… I love you, too.” And then, unbelievably, she started to come back to life. Although we were all far from home during our ordeal, we were not alone. The kindness of others started right away and an avalanche of support poured in. There was someone to take me to the airport, my duplex mates to watch Andrew, my Aunt and Uncle, and cousin’s family in Boise to pick us up, house us, feed us, and stay with us through it all. And there were the prayers. They came from everywhere. My mother’s church friends stopped a meeting and fell to their knees. Hundreds of family friends kept her in their thoughts and even parents from my school kept close vigil. One parent, for whom I will ever be grateful, kept a candle burning and prayers constant during the worst of her illness and long after my mom started to recover. There was even a silent order in Ireland that had my mom’s name on their prayer list. Our family’s prayers were mixed with all the others that floated up into the great unknown. Prayer is a funny thing and I wrestle with the injustice of asking for my own desires to be fulfilled even as others suffer right next to me. However, there is undeniable beauty in coming together to confront our shared helplessness with each other. My mother is on her way to a full recovery and I am grateful to the doctors and modern medicine’s ability to fix many of the body’s failings. However, all of us who were there know there was something more than medicine that saved her. Some will say it was the power of prayer, others will say that it was having her family by her side, and some will attribute it to her tenacious will and strength of spirit. Regardless of how or why, I am grateful to all who supported us and keenly aware that this journey, that we call life, is best taken in community and not alone. Mom is almost completely healed and we no longer worry that this illness will take her away from us. I am starting to return to the routines to which I’ve grown accustomed, but I am determined to see life, for what it is: one fleeting moment that we call the present. We can hope that each moment, is followed by another, but there is no guarantee. Grief and tragedy can open us up to seize every moment and the beautiful possibilities of the future or it can harden us into a life devoid of risk. I only have to look to Andrew and the answer of how I should respond is clear. Grief is ultimately about letting go. And life can’t be fully lived without it. Earthquakes will come, but vases still must adorn our mantles. They do no good when sitting in a box for protection. Dandelions must still be plucked and blown into the summer breeze with no hope of ever catching one of its seeds as it floats off into the summer sky. It is futile to try and gather dandelion seeds, anyway. Letting go of them is why we blow them away in the first place and because each little spore holds within it the infinite possibilities of life’s beautiful potential. Cherries are the ultimate Carpe Diem fruit. Their season is spectacularly short in California. It comes in June and if you blink you will have missed it. This year, I blinked. I had full intention of preserving cherries in Grappa to be ready for a Christmas treat, but when I went back to the farmers market, they were gone. However, it turns out that cherry season in Boise, Idaho, is in July and this time I didn’t blink. 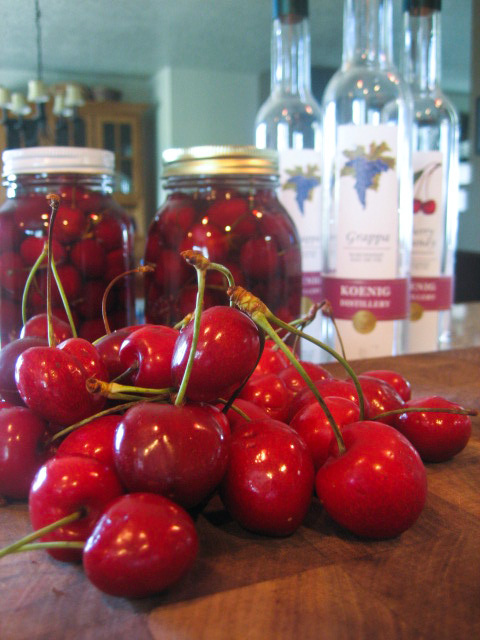 During one of the breaks from the hospital, my cousin took me to her CSA’s local farm and we picked up 10 pounds of freshly picked cherries, a couple bottles of a locally made Grappa and in about an hour had three quarts put away. That’s when my cousin took out some pickled cherries for me to try. Wow! Now I needed more cherries. I bought five more pounds and was able to get them back to California before they spoiled. Pickled cherries may sound awful to some, but you will have to trust me on this one; they are fantastic and have many uses. Serve them with roasted meat, over a block of cream or goat cheese, or as an addition to an appetizer plate with salami and cheese. Another reason to make this recipe is for the byproduct of the cherry-infused pickling juice, which with a few additional steps makes a seductive syrup that can be used for crepes, a glaze for sautéed chicken or pork, or as the acid portion of a vinaigrette. It also works well to flavor vodka for an interesting martini! Remember, cherry season, like life, can be unpredictable. Make Carpe Diem your summer mantra and go out and seize the day! This recipe is based on one from the June 2011 issue of Bon Appétit. I am giving the recipe as printed in Bon Appétit with notes on changes, optional ingredients, and making the syrup. Bring first 5 ingredients and 3/4 cup water to a boil in a medium stainless-steel saucepan, stirring to dissolve sugar. Reduce heat to medium; simmer 5 minutes. Using a fine-mesh sieve, strain into a medium bowl; return liquid to pan. Add cherries and rosemary to saucepan. Simmer until cherries are tender, 3 to 5 minutes. Transfer cherries and rosemary to a 1-quart mason jar. Pour in enough pickling liquid to cover cherries. Cover and chill. Do Ahead: Can be made 1 month ahead. Keep refrigerated. Strain before serving. My cousin replaced the rosemary for oregano and the coriander seed for cumin. It was equally delicious. I also quadrupled the recipe and added ½ cup more sugar or an 1/8 cup more per batch. The rosemary can be strong and you don’t need four large sprigs if increasing the recipe. Use two or three at the most. 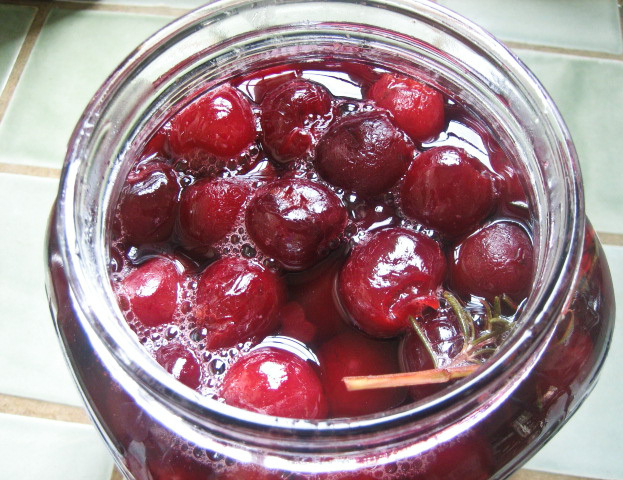 You will have more pickling juice than you need to cover the cherries. Take all the additional juice and add sugar starting with ¼ cup per batch and increasing until you get the right sweetness for you. Because I quadrupled the recipe, I ended up using a cup or a bit more for my syrup. Next, boil the mixture and reduce it until you get a thick, syrupy consistency, about 5 minutes. Pour a little out, let it cool, and add more sugar if needed. Boil a bit longer if you would like thicker syrup. Put it in a bottle or jar and keep in the fridge. I don’t know how long it will last, but it will be gone before you have to worry about it. 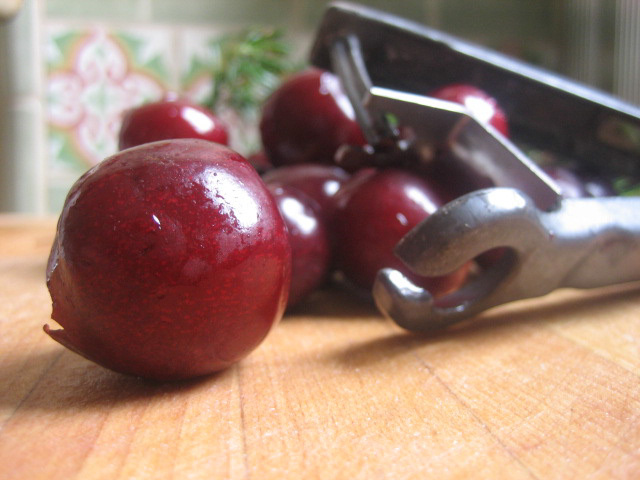 When the cherries are used up, make more syrup with the remaining juice. This recipe is based on one from a fantastic book on Tuscan cooking. “Piano, Piano, Pieno”, by Susan McKenna Grant is the truly authentic version of “Under the Tuscan Sun.” Susan gave up her day job, bought a Tuscan farm, and actually farms the land herself, all the while cooking and preserving from the land. More of a concept than a recipe, this is really just putting fruit in a sterilized mason jar, covering it with alcohol, adding a few whole spices, and sealing it until Christmas. Anne Willan, in “Country Cooking of France” offers a similar concept call “Old Bachelor’s Macerated Fruits”. In her version you use about half a pound of fruit with 1/2 cup sugar and cover with vodka or cognac. As fruits come into season, you open the jar and add them with sugar and alcohol until the jar is full. They are held for at least three months… about Christmas time (It seems that Southern Europeans enjoy the holidays more than we do!) She does not add whole spice, but I would think the addition of Star Anise, Cinnamon, clove, and allspice by themselves or mixed and matched would be a nice addition. Being the first time I’ve tried this, I used Idaho Cherries, Idaho Grappa and Cherry Brandy from Koenig Vineyards and added about 1 1/2 star anise, 1/2 stick cinnamon, and a couple of cloves. You will have to wait until Christmas to see how this batch turned out and what adjustments may be needed. I suggest you buy a bag of cherries or fruit, a bottles of Grappa and try it out yourself and we will compare notes in about five months. Beautiful, thoughtful words as always. I’m so sorry to hear of the scare you had and so relieved and happy for you that Mom is on the mend. Nice work as always Don! Enjoyed some of the pickled cherries as a side to tri-tip our first night with Joanna and Wes. They were excellent. Don, I made more pickled cherries after you left. I’ve used up the pickling liquid from the first batch for lots of things and most recently used it as a replacement for the lemon juice in the beets and greens I made when you were here. It was fantastic. I want to put it over some vanilla ice cream too!! Of course, the pickled cherries will likely always remind me of the unplanned visit here of my dearest cousins and my beloved aunt and uncle. I am so grateful that my Auntie Carol is well again and am looking forward to enjoying some of those drunken cherries with her at Christmas this year! I’m so glad to hear things are better with your mom. An eloquent post, as always! wow. You are a really good writer Uncle Don. You need to teach me! Previous post: Guess Who’s Coming (Out) At Dinner?